Sierra Nevada Corporation IP used with permission. Sierra Nevada Corporation (SNC), a privately held electronic systems provider and integrator specializing in microsatellites, telemedicine, and commercial orbital transportation service, launched its new exhibit at AUSA by choosing Access TCA as its partner. 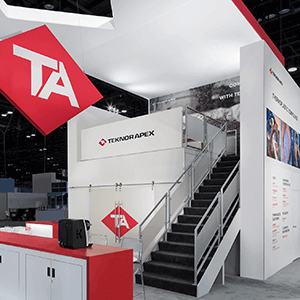 The exhibit featured two closed-door conference rooms as well as informal seating; multiple product demo areas; and a high tower and hanging sign so that the exhibit could be viewed across the trade show floor. Vivid graphics formed the backdrop for a helicopter model; as a matter of fact, large format graphics were placed strategically on many available surfaces. Access helped SNC bring its theme—Dream, Inspire, Innovate—to life for the military audience.